Some people are naturally a bit hot headed and find themselves charging into things without really thinking it through. The hot headed person can become worked up easily and isn’t afraid to express themselves, sometimes this can off as a bit aggressive to others. 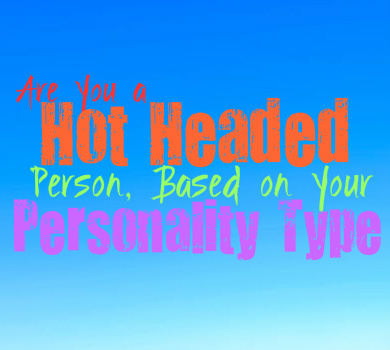 Here is how hot headed you are likely to be, based on your personality type. INFJs are not often hot headed people, simply because they keep a lot to themselves. They might become worked up over something, but can usually maintain their cool around others. INFJs have so much going on inside of their minds, and so expressing everything outwardly isn’t always natural for them. When they are truly and sincerely angry about something, they can have an intense and even intimidating side. While they do have moments where they feel justified in their anger, they are rarely hot headed or impetuous people. ENFJs try to be more controlled people and don’t let doing anything that might upset others. At the same time they can be intense at times, and this can cause them to be a bit hot headed. The hot headed side of the ENFJ comes out when they are passionate or worked about something, and so they want to stand up for these beliefs. They can also be this way when it feels like someone is challenging their constant efforts or their intentions. INFPs do have a strong connection to their inner emotions, which can sometimes cause them to appear a bit hot headed. When the INFP is truly passionate about something they can sometimes show this in more intense ways. If another person pushes them the wrong way the INFPs more hot headed side definitely comes into play. This is simply because they are passionate people who stand by what they believe in and feel things very deeply. ENFPs can sometimes be impulsive and hot headed people, but this comes from the fact that they are also highly passionate. When the ENFP feels something deeply they don’t find it easy to really cover this up or shy away from it. So when they feel intensely about something it can come out in ways that make them appear rather hot headed to others. ENFPs also have a tendency to go after what they want in ways that certainly seem hot headed and even overpowering. INTJs can be hot headed people sometimes, especially when they are sure about something. They are intense when it comes to information and even in proving their point. They don’t simply back down because the conversation gets a bit heated, and aren’t afraid to stand up for what they know and believe in. INTJs can be rather aggressive in their pursuit and spreading of knowledge, and so sometimes this makes them appear to be hot headed people. For the INTJ it isn’t about being aggressive, it is simply about the fact that they are sure of what they know. ENTJs can certainly be hot headed people, who have a tendency to stand up for themselves in rather aggressive ways. They are intense when it comes to their beliefs, as well as how they approach their goals in life. ENTJs don’t like allowing anything to stand in their way, and so they push through no matter what tries to hold them back. If someone challenges them or does not respect them, the ENTJs response can certainly be both hot headed and even a bit aggressive. They simply are sure of the things they know and are capable of, and so they don’t allow anyone to try and ignore that. Most of the time INTPs are viewed as more mellow and internalized people. They keep to themselves a lot and prefer to focus on their own inner thoughts. They have vivid imaginations and are very analytical people, and they spend so much time just thinking about different ideas and information. Because they do spend a lot of time on their own, people can sometimes miss the fact that INTPs do have a sometimes hot headed side. They can become rather intense when their emotions bottle up and finally come to the surface, and so this is something that makes them appear rather hot headed. ISTJs are often viewed as controlled people, who don’t like allowing their emotions to get the best of them. Because of this they try to avoid being seen as hot headed, and believe in doing their best to maintain control. ISTJs do have moments where they can become hot headed, especially when they are being challenged by someone who does not know what they are talking about. Most of the time though, the ISTJ isn’t hot headed simply because this shows a lack of self-control. ESTJs do have hot headed qualities, mostly this is tied to their tempers. They have moments when they can become frustrated and this is often because someone is not being efficient or putting in the right amount of effort. ESTJs can lose their tempers because of this, and this causes them to appear rather hot headed to those around them. ESTJs simply know how they like things to be done and have little patience for people who cannot seem to adhere to this. ISFJs are rarely seen as hot headed people, simply because they strive to maintain a sense of control over themselves. They don’t like losing their tempers, especially since they value keeping the peace. ISFJs want to maintain harmony in their environments and so being a hot headed person could really put this goal in jeopardy. For the ISFJ being hot headed would be a major setback, one they are not comfortable with accepting. While ESFJs prefer to remain controlled, they might have moments of being a bit hot headed. They often work so hard to keep a sense of control of their emotions, and sometimes this causes them to bottle things up too much. When the ESFJ has bottled up their emotions for too long they might find themselves blowing up when they feel pushed over the edge. During these moments the ESFJ can appear rather hot headed, but this is something they do try hard to avoid and keep away from others. ISTPs can be somewhat hot headed people, especially when they are excited about something. They live so much in the moment that sometimes they let go of any restrictions that might prevent them from reacting intensely about something. This can cause the ISTP to have hot headed moments and find themselves diving into something with a lack of caution. ESTPs are intense and passionate people, who go after what they want. They live so much in the present moment and sometimes they can have rather thick tempers. When the ESTP gets worked up about something they can certainly be hot headed with their responses. While they are fairly good at bouncing back and coming to their sense, in the moment the ESTP can become truly hot headed. ISFPs are known to follow their emotions, which is something that can cause them to be hot headed at times. When they feel intensely about something they find themselves reacting without really thinking it through all the way. This does make the ISFP do and say things which cause others to see them as hot headed and a bit emotional at times. ESFPs are passionate and definitely hot headed people, but this is simply because they go after what they want. ESFPs don’t allow fear to keep them from living their lives, and sometimes their emotions can get the best of them because of this. They live in the present moment and do what feels right to them, even if their behavior can be emotion or even hot headed.